Arturo Fuente 8-5-8 Maduro Cigars come in a darker maduro wrapper making for a more flavorful smoke. Arturo Fuente 8-5-8 Maduro Cigars come in a darker maduro wrapper making for a more flavorful smoke. This cigar is not bitter or harsh, and features excellent construction and well balanced flavors. These cigars represent four generations of tradition, pride and sacrifice for the Fuente family. Rated 86 (very good to excellent) by Cigar Aficionado Feb. 2007. Arturo Fuente is one of the most popular brands in the world and for a good reason. Master cigarmakers Carlos Fuente Sr. and Carlos Fuente Jr. craft impeccable cigars of the best quality from their Dominican factory. 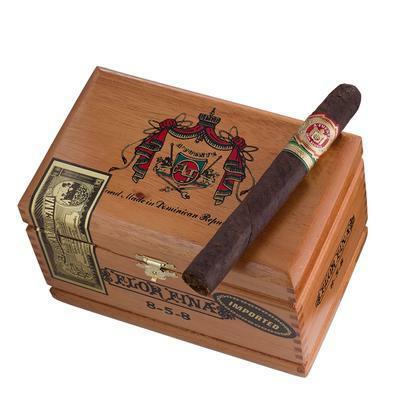 The Arturo Fuente Flora Fina Maduro 8-5-8 is a part of the Gran Reserva line of cigars, which features Connecticut Broadleaf Maduro wrapper.